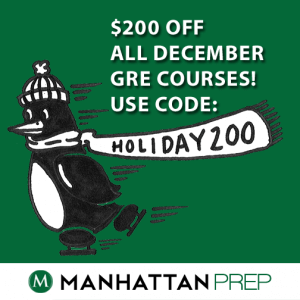 Manhattan Prep’s Black Friday GRE Special! One of the biggest shopping days of the year has arrived–Happy Black Friday! In case you’re too full of turkey and stuffing to make your way out to the shops today, we’re serving up something extra special. Today through December 15th, we’re offering $200 off all of our Complete GMAT, LSAT, and GRE courses*! This deal includes all Complete Courses– in-person as well as Live-Online. To receive this limited-time discount, register for a course that starts in December and enter the code Holiday200 at checkout.t! Studying for the GRE take a free GRE practice exam, or try out one of our upcoming free Manhattan GRE trial classes, running all the time near you, or online. And, be sure to find us on Facebook, LinkedIn, and follow us on Twitter! For the first time ever, Manhattan Prep is holding a one-day audition for new GMAT, GRE, and LSAT instructors! Come join us December 14, 2014 at 9:00 AM and transform your passion for teaching into a lucrative and fulfilling part-time or full-time career. 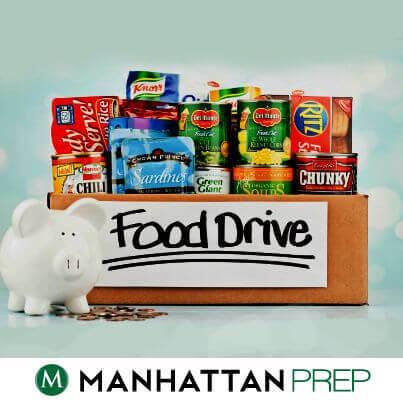 Manhattan Prep offers instructors flexible hours and great pay ($100/hour for all teaching and tutoring). In addition to teaching classes, instructors can work on other projects such as curriculum development. Our regular instructor audition process, which includes a series of phone, video, and in-person mock lessons, usually takes weeks, even months, to complete. However, we are offering a one-day event on December 14th for teachers interested in working with us. Candidates who attend will receive a decision that day. The event will take place at our company headquarters at 138 West 25th St., 7th Floor, in Manhattan, New York City at 9:00 AM EST. It is open to candidates who live in the tri-state area, who have teaching experience, and who are GMAT, LSAT, or GRE experts. The day will include several rounds of lessons, as well as other activities. Each round will be pass/ fail. The day will begin at 9 AM and may last as late as 4:30 PM for those who make it to the final round. Candidates will need to prepare lessons for some rounds; we will send a more detailed instruction packet to those who sign up for the event. To register, please email Rina at auditions@manhattanprep.com. Make sure to include in your full name, an attachment of your resume detailing your teaching experience, and an official GRE, GMAT, or LSAT score report. We look forward to meeting you on December 14th! In the spirit of the holiday season, we will be collecting non-perishable food to be donated to New York’s City Harvest now through Dec. 20th! Our goal is to collect a minimum of 200 food items including but not limited to: canned goods, peanut butter, mac-n-cheese, cereal, soups, pastas, etc. We will also be collecting children’s toys to be donated to the Marine Toys for Tots Foundation with a goal of collecting a minimum of 50 new toys to be distributed to needy children in NYC. Finally, we are also collecting clothing to be donated to the New York Cares Coat Drive. Our hope is to collect a minimum of 50 new or gently used coats, sweaters, and blankets. All Donations may be made at 138 West 25th St, 7th Fl. New York, NY 10001. Donation bins and flyers have been placed on the 7th floor. Please join our efforts to make this season brighter for our community and those in need.